Last month I gave an overview of the USB kernel subsystem, but I hadn't the space needed to show real code at work. This month we'll fill the gap by looking at sample drivers implementing input devices in the USB framework. The code being introduced has been developed and tested on version 2.3.99-pre6 of the Linux kernel, running on a PC-class computer. 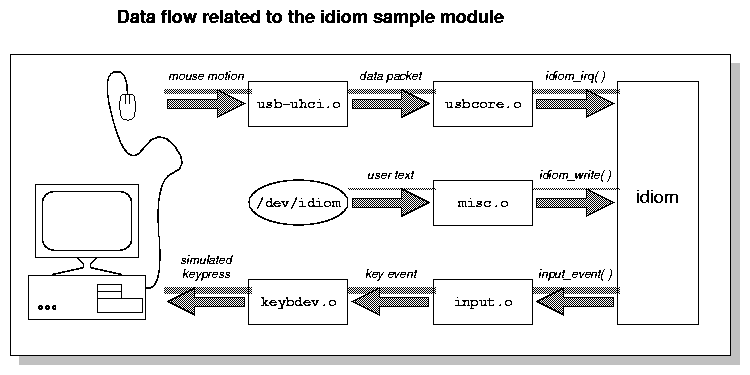 The sample module introduced here is called idiom (Input Device for Intercepting Output of Mice), and its well-commented source code is available for download from here . The sample module registers itself with the USB kernel subsystem as a mouse driver and with the input management subsystem as a keyboard driver. As a keyboard, idiom only reports arrow events, according to how the physical mouse is moved. Since the module registers itself as an USB device, you won't be able to test its workings if you have no USB mouse to generate events. To partially fill the gap, idiom offers an additional entry point, /dev/idiom, where you can write text strings that will be converted to USB keyboard events. The overall design of the module is depicted in figure 1. As outlined in the previous article, the USB input device driver must connect to two different infrastructures: the usbcore device driver that handles hardware events on the USB port, and the input module that collects and dispatches input events. In addition, idiom registers an entry point with the misc device driver. The figure shows how th device attaches to the three working environments using kernel facilities. The first two commands load the USB machinery and an hardware driver for your host controller (not needed if you have no host controller on your computer and you plan to use /dev/idiom. The second pair of commands loads the input management machinery and the driver that consumes keyboard events. The last pair loads idiom itself and creates the associated misc device. You should remove /dev/idiom when you are done with these tests, or modify idiom.c to use /proc or devfs instead of the misc device. Actual activation of the module happens within the idiom_probe function, called whenever a new device is plugged into a USB socket. The core of the probe function deals with detecting whether the new device is of the right kind or not, and I'm skimming over that part. If device identification in the probe function goes well, a new device structure must be allocated -- you could use a static structure, but then your module won't support more than one device of the same type at the same time. The macro FILL_INT_URB above is used to fill the URB data structure to describe ``interrupt transfers'' with the device. The USB specification defines four types of transfers (control, interrupt, bulk, isochronous), and the mouse device falls in the ``interrupt'' class. Interrupt transfers are not actually interrupt-based but rather happen as replies to polling performed by the host controller (driver). The parameters of the macro call are used to initialize the field of the URB data structure, and the interested reader is urged to refer to <linux/usb.h> for the details. The interesting arguments here are idiom_irq and maxp. The former is the pointer to the complete handler, which eats data packets after completion of each transfer. The latter is the maximum length of the data buffer, which is set to three for the mouse driver -- although the protocol is actually made up of five-bytes packets, we only use the second and third byte; feel free to check usbmouse.c for differences in this initialization sequence. These few lines of code are all that's needed for a device driver to interact to the USB framework. Even though things get slightly more complicated for different types of data transfers, the general rules outlined here apply, and the sources of real device driver will be a good reference for the curious reader. We already know that reacting to USB data transfers is only half of the work of an USB device driver: the other half deals with communicating data to the external world. As far as input devices are concerned, the actual communication with the external world is performed by the input module, and the USB driver needs only to feed data to that module. What's most apparent here is that everything is laid out in bitmasks: the driver must state that it only reports key events and also specify which keys will be generated (in this case, the four arrow keys). If you check <linux/input.h> you'll find several bit indexes defined, as other input channels are handled in the same way. When the input device is registered with the input framework, the function input_event can be called by the driver whenever it has new data to feed. Within idiom, data is received by idiom_irq, and it's that very funtion that routes new data to its final destination. These few lines of code turn an USB mouse to an arrow farm whenever you load idiom instead of usbmouse. The function input_report_key is actually a wrapper to input_event: the first call showed above expands to ``input_event(idev, EV_KEY, KEY_LEFT, 1)''. While I personally would call input_event, it's more common practice to use the wrapper macro instead. To help people playing with idiom even in case no USB mouse or USB-capable computer is there, I added to the module support for a misc device. Use of the device is simple and straightforward: a new idiom device is created by the module whenever the device is opened, and a mouse movement is simulated whenever an uppercase or lowercase letter in the set ``u, d, l, r'' is printed to the device. For example, ``echo uuull ">" /dev/idiom'' will generate three up-arrows and two left-arrows. The implementation of the device entry point is confined to the final part of the source file for idiom, with the exception of the registering and unregistering calls, which are invoked at module initialization and shutdown. Even though use of a ``simulated'' USB device cannot give the thrill of driving a real device, I hope this trick will help people with no USB hardware to begin lurking in this new arena of peripheral devices. Be warned, anyway, that this discussion limits itself to the simplest available device, and driving a different device like a digital camera is quite a different kind of task, with new and interesting problems to face. Alessandro is an independent consultant based in Italy, who suffers from high load and premature obsolescence. He reads email as rubini-at-gnu-dot-org.